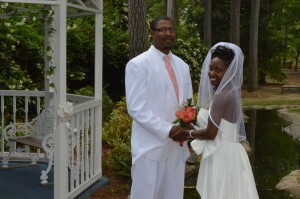 Vanessa Faulk of Lumberton, North Carolina and Alex Bethea of Lakeview, South Carolina were united in marriage on May 18, 2013 at Wedding Chapel by the Sea in Myrtle Beach, South Carolina. Rev. Lindsey Inman officiated. A reception followed at Golden Corral. The bride is the daughter of Clara Faulk and Lemore Smith. She is the granddaughter of Louise and James Faulk. The bride’s attendants included Taren Faulk, Lemore Smith, and Amaya Bethea all of Lumberton, North Carolina. The groom is the son of Barbara Bethea and Alfonza Page. Price Bethea of Lakeview, South Carolina served as the groom’s attendant.